You may refer YEELEE, KKB & HAIO trend to do $ projection, how high will KFC go! 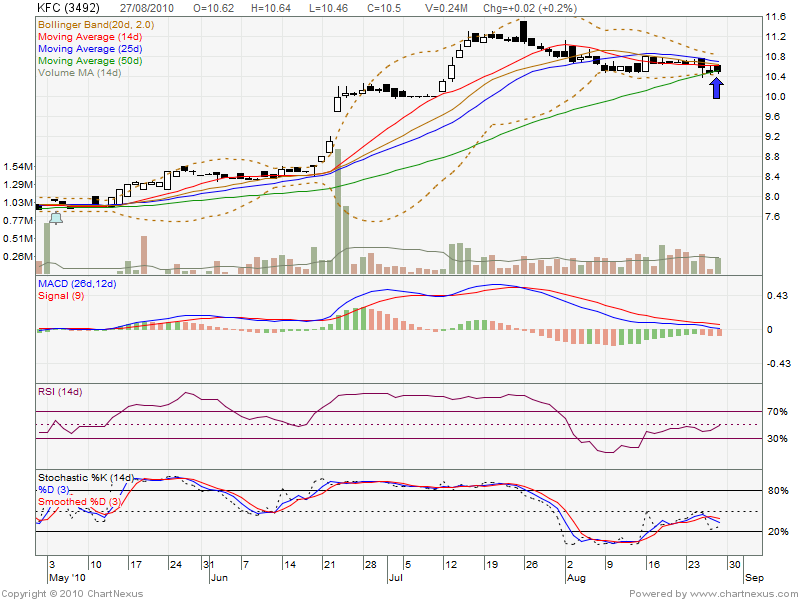 From the chart, KFC trade at MA50 support level, which around RM10.50. Ex-date is around the corner, so a lot of ppl will start acquire the volume. As i go through the historical, KFC definite is defensive stock, economy downturn their stock price still stay strong. So, this round after share split + bonus issue, a lot of ppl effort take position, sure will boost up the stock price. 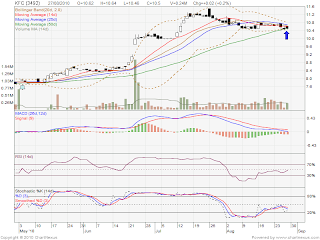 Do take note that, their WARRANTs, expected will be very attractive as GAMUDA-WD, long rally! Let watch closely this few days, do not miss the opportunity! hello, can I know you using what chart system? Will BJTOTO break up bolinger band squeeze? Will OSK break up bolinger band squeeze?